This hull was named after my best friend of 38 years. I had been working on the 12ft Padilla Bay skiff, and showed Nick the finished model. 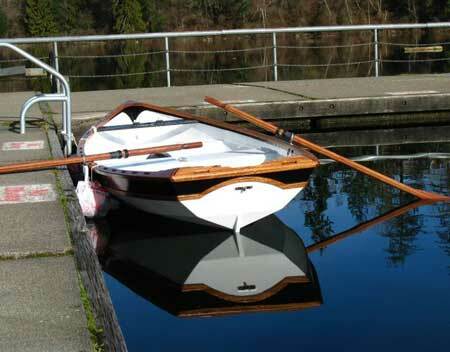 He liked the hull, but was more partial to the rounder bottoms of my boats like the Laura Bay and PUD-g designs. I told him I'd see what I could do and started on this new design. I had been working on a model with a wineglass transom, but was having a hard time getting the bottom two panels to twist enough to come together at the stern. I have since found a way to do this, but not for this hull. This one will use a "keel strip" that starts from about the last 1/3 of the hull, and extends to the bottom of the stern panel to give it a straight keel to sit on. I also changed the stern panel from one piece to two, so I could add more character to the hull. When I slipped the Granville Bay into the water, I was happy to see that the hull sat on it's lines like the cardboard model had when I did the initial tank tests with scale weights. It sits light in the water, and as weight is increased in the hull, the boat lowers, but the hull widens so much as it does, that theres plenty of extra built in displacement to carry it. In the videos of me in the hull, there is not much difference in the waterline from an empty hull. I was impressed on launch day as to how effective the keel strip was in making the hull track straight as I rowed around Lake Wilderness. I was able to spin the hull in place by counter strokes with the oars, but it was more work than in my other hull designs, and this is another indicator that the keel strip along with the hull shape, keeps the boat on track. I didn't have a GPS with me to tell what the rowing speed was, but it moved along with less effort than the O&P Pod (3.5mph/easy rowing), which has been the easiest rowing hull of my designs so far. It also has a very long "glide" after you stop rowing at hull speed. Again I was impressed by how the hull moves through the water, and the smooth surface of the water in the hull's wake. I tried to keep all the volume in the stern area that I could, and still have enough "up sweep" to give the hull some style. The beam is 56" (including the rails), and there should be plenty of freeboard when loaded. Maximum people weight is 2 ½ persons, and with an optimal weight for two adults. Like the O&P Pod, the Granville Bay has less flotation/support in the bow and stern (unlike the Nuthatches which have a much wider foot print), so the seats are moved inward to keep weight out of the ends. On the O&P, I got the depth of the foot well correct on the first design, but I have moved the foot well back a few more inches in the build/study plans for the GB12. You might want to copy the dual port and stbd tanks used under the middle seat, with a set of hatches on either side of the gap under the stern seat, or placed on either side in the seat top. You could line the interiors with insulation, and have dual coolers. 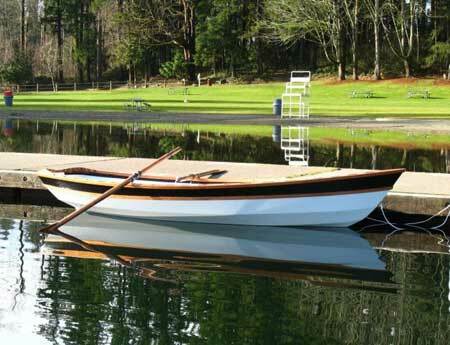 At a streamlined 12 feet, this is not a weekend cruiser to carry a lot of camping gear in, but a fun boat to row around the lake, or go day sailing in. 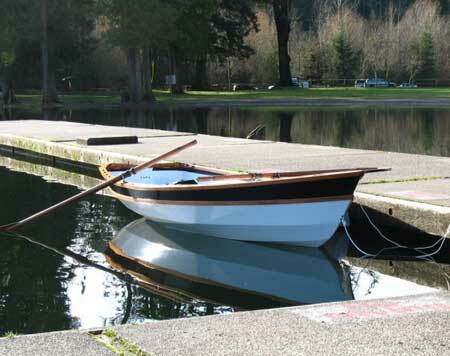 The maximum outboard by U.S. Coast Guard calculations of the ratio for beam width to stern width, is 3hp. I would only use an outboard with two people on board, as the bow rises too far out of the water with one person sitting in the stern. I never really considered the use of and outboard with this hull anyway; with the exception of the Electric Paddle. 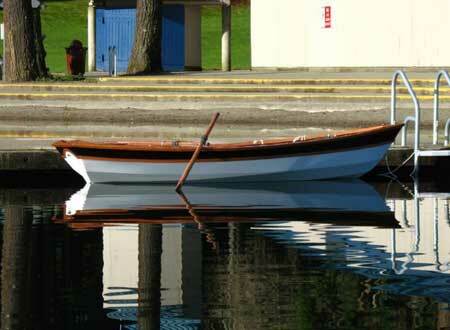 It was designed as a mainly single person rowing and sailing hull. This hull is also CE/CLR balanced for use with the Neil Pryde 64sq ft sprit sail I helped design, and should have more than enough power to make you grin. While I had the hull next to the dock, I used one finger to push on the calculated CLR position on the hull, and it moved sideways with absolutely no turning as it should have based on my paper tests. The boat should sail very well, but I will have to test this first and make a video for my www.youtube.com/redbarnboats site. I like all my designs, but have to admit that this hull is my favorite so far. Let me know what you think of the 12ft Granville Bay. click the image above for a free PDF file to print and build a model from.